MAIN_STONE : Blue Sapphire. MATERIAL : Gemstone. OCCASION : Party. MAIN_STONE_SHAPE : As Seen In Picture. STYLE : Drop/Dangle. New ListingFantastic Yellow Sapphire Ethnic .925 Silver Jewelry Earring 2.3"
MAINSTONE : Yellow Sapphire. OCCASION : Party. All our jewelry is 100% natural conflict free. MAINSTONECREATION : Man-Made. Get In Touch To Buy beautiful 14k Solid Gold Huggie Earrings Huggie earring 11MM Blue Sapphire Hoop Earrings Gemstone Hoop Earrings Blue Sapphire Huggies Tiny Hoop Earrings Jewelry At Wholesale Price. Designer Gemstone Earrings. Sapphire Jewelry. Carved Gemstone Pendant. Fusion Gold Earrings. Diamond Evil-Eyes Charm. Gemstone Gold Earrings. Turquoise Diamond Jewelry. Diamond Religious Charm. Pave Diamond Bangle. Polki Diamond Bangle. Diamond Wedding Bangle. 925 Sterling Silver Jewelry. Pave Diamond Bead Ball. Rose Cut Diamond Bead. Wide Cuff Bangle. Sapphire Jewelry. Pave Diamond Jewelry. Pave Diamond Bangle. Pave Diamond Bead Ball. Sapphire Jewelry. Diamond Feather Jewelry. Fusion Gold Earrings. Turquoise Diamond Jewelry. Designer Gemstone Earrings. 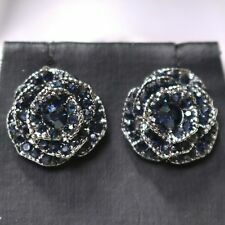 New ListingBEAUTIFUL 0.40 CT. RICH BLUE SAPPHIRE STERLING 925 SILVER EARRINGS . BEAUTIFUL 0.40 CT. RICH BLUE SAPPHIRE STERLING 925 SILVER EARRINGS. OTHER : WHITE SAPPHIRE ROUND DIAMOND CUT 1.2 TO 1.7 MM. COLOR : RICH BLUE. FACE EARRINGS 13 X 13 MM. SHAPE : ROUND CUT & ROUND DIAMOND CUT. We are quick to communicate if there are any delays otherwise expected. COLOR : AAA KASHMIR BLUE ( MAIN STONE ). ( MAIN STONE WEIGHT 10.20 CT. ). OTHER : ROUND DIAMOND CUT WHITE SAPPHIRE 2.0 MM. SHAPE/CUT : PEAR FACET ( MAIN STONE ). UNIT OF ITEM : 2. "Your happiness is the most important thing to us. We will be happy to resolve any issues you may have in a cordial and friendly manner. If you find any problem with the item and we will surely solve the problem. All products are quality checked. Otherwise deal is final. Each piece is hallmarked 925. FIRST ITEM USD 4.5. GOLD QUALITY 10K. 1 PAIR EARRING. Cut / Shape: Rose Cut Cushion & Pear Shape. HOOK EarWire. 925 Sterling Silver Jewelry. Sapphire Jewelry. Fusion Gold Earrings. Turquoise Diamond Jewelry. Designer Gemstone Earrings. Victorian Earrings. Pave Diamond Jewelry. Natural Ruby Jewelry. All of our jewelry are designed at our own art studio and handmade in our own factory. Natural 0.10 Ct. Sapphire Gemstone Designer Stud Earrings 14k Yellow Gold Handmade Fine Jewelry. Sapphire wt. 14K Yellow Gold : 1.10 gm (Approx). Diamonds Studs Gold diamond Rings Gold Diamond pendant Diamond Necklace. Pave Diamond Jewelry. Pave Diamond Bangle. Pave Diamond Bead Ball. Rose Cut Diamond Bead. Sapphire Jewelry. Fusion Gold Earrings. Turquoise Diamond Jewelry. Designer Gemstone Earrings. About Earrings :-. This is an authentic Unique Earrings.You will receive a Earrings as shown in picture. Color:- Blue. Kindly don't falter to reach us for any reason. We will do our best resolve your issues. 925 Sterling Silver Jewelry. Sapphire Jewelry. Fusion Gold Earrings. Diamond Evil-Eyes Charm. Natural Ruby Jewelry. Diamond Religious Charm. Turquoise Diamond Jewelry. Designer Gemstone Earrings. Pave Diamond Bangle. Polki Diamond Bangle. Diamond Wedding Bangle. 925 Sterling Silver Jewelry. Wide Cuff Bangle. Pave Diamond Bead Ball. Rose Cut Diamond Bead. Sapphire Jewelry. These gorgeous earrings have lots of sparkle. Earrings may be slightly irregular due to the fact they are hand made. FYI: White Topaz is Aprils Modern Birthstone and Padparadscha Sapphire (Paddy) is Septembers birthstone. ( MAIN STONE WEIGHT 5.78 CT. ). OTHER : ROUND DIAMOND CUT FINE PINK SAPPHIRE 1.5 MM. COLOR : TOP BLUE PURPLE ( MAIN STONE ). SHAPE/CUT : OVAL FACET ( MAIN STONE ). UNIT OF ITEM : 2. RING SIZE : N/A. FACE 1.3 X 1.1 CM. Designer Gemstone Earrings. Sapphire Jewelry. Fusion Gold Earrings. Natural Ruby Jewelry. Turquoise Diamond Jewelry. Victorian Earrings. Pave Diamond Jewelry. Diamond Charms. Pave Diamond Bangle. Polki Diamond Bangle. Diamond Wedding Bangle. Pave Diamond Bead Ball. Rose Cut Diamond Bead. Wide Cuff Bangle. Sapphire Jewelry. Pave Diamond Jewelry. These gorgeous hand crafted earrings have lots of sparkle. These earrings have a princess cut Padparadscha Sapphire gem that is 6 mm across which is Surrounded by 20 round Natural White Topaz gems. Going around the sides of the earrings are another 20 natural White Topaz gems. Pave Diamond Jewelry. Pave Diamond Bangle. Pave Diamond Bead Ball. Diamond Feather Jewelry. Sapphire Jewelry. Fusion Gold Earrings. Mother of Pearl Pave Diamond Blue Sapphire 18k White Gold Dangle Earrings. Rainbow Multi Sapphire Gemstone Ear Cuff Earrings Diamond Solid 14k Yellow Gold VS1 Clarity F Color Jewelry. Multi Sapphire wt. 14k Yellow Gold Weight 2.00 gm. Diamonds Studs Gold diamond Rings Gold Diamond pendant Diamond Necklace. Pave Diamond Bangle. Polki Diamond Bangle. Diamond Wedding Bangle. Designer Gemstone Earrings. Pave Diamond Bead Ball. Rose Cut Diamond Bead. Wide Cuff Bangle. Sapphire Jewelry. Multi Sapphire wt. Diamonds Studs Gold diamond Rings Gold Diamond pendant Diamond Necklace. 14K Yellow Gold : 1.2 gm (Approx). Gemstone Information. This Earrings available in all three Gold (Rose / Yellow / White). SAPPHIRE & 925 SILVER EARRINGS. COLOR : TOP CHAMPAGNE & WHITE ( MAIN STONE ). SHAPE : ROUND DIAMOND CUT ( MAIN STONE ). RING SIZE : US N/A. OTHER : FACE 3.2 X 1.0 CM. IF VERY HIGH QUALITY & FREE FROM INCLUSIONS. COLOR : TOP KASHMIR BLUE ( MAIN STONE ). ( MAIN STONE WEIGHT 7 CT. ). OTHER : ROUND DIAMOND CUT WHITE SAPPHIRE 1.5 MM. SHAPE/CUT : OVAL FACET ( MAIN STONE ). UNIT OF ITEM : 2. RING SIZE : N/A. FACE 1.3 X 1.1 CM.